The AYB Drumline is an exciting ensemble that follows the traditions of the American-style drum corps and is complete with a snare line, bass line, tenor drums and cymbals. The Drumline performs predominantly with the AYB marching band, but also performs independently. 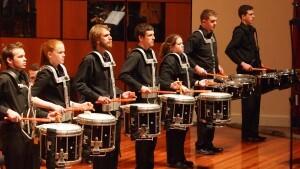 Past Drumline performances have included corporate events, sporting events for Melbourne City FC and a feature in concert with Keith Urban. Young drummers with at least 1-2 years playing experience are invited to join the dynamic AYB Drumline and learn some new and exciting drumming skills. 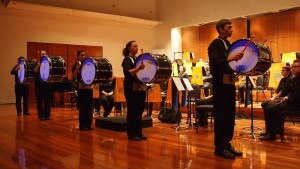 The AYB Drumline fosters the development of drumming technique through rudimental drills and technical drum cadences and prepares a repertoire of fun and challenging drumline charts which feature at the AYB Annual Concerts. 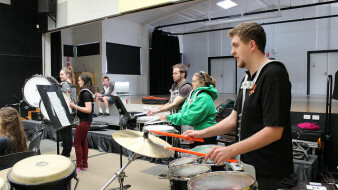 The Drumline also works hard to memorise marching charts to add that distinctive drumline sound to the AYB marching band. Katherine Gekas has been playing drums for 17 years and has performed with a number of percussion ensembles and bands. Katherine has been in the AYB Drumline since 2007. She has had experience on cymbals, bass drum and snare drum and is currently the lead snare player of the Drumline. Katherine also plays tenor drums in the City of Melbourne Highland Pipe Band. Her expertise on the tenors saw her awarded 1st place in the B Grade tenor drumming Championship for Victoria in 2015 as well as 2nd place in A Grade at the Australian Championships in the same year. Katherine performed at the Sydney Edinburgh Military Tattoo in 2010 and again at the Tattoo in Melbourne in 2016. – Perform an AYB Drumline marching chart and a part of an AYB Drumline feature piece. Membership is available to musicians aged between 15-28 years. The AYB membership fee of $225 is due on 1 April each year. Members who pay within the early bird period or join half way through the year are entitled to a discount. If you are excited by the prospect of joining this electrifying ensemble, contact us today to organise a time to visit the Drumline.